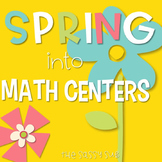 2nd Grade Spring Math Centers: Ballpark Estimates, Arrays, Measurement and more! 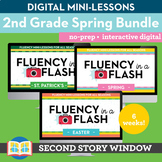 This is a bundle of my 2nd Grade March, April, and May packets. 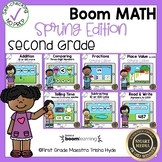 This Second Grade Spring Common Core No Prep Bundle contains activities that are fun, engaging, and common core aligned. 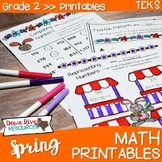 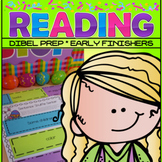 Math and literacy activities are included and the common core standard addressed is printed clearly on each page. 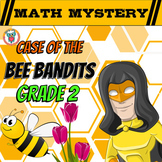 This game provides practice to build fluency in adding and subtracting within 100 as described by CCSS.MATH.CONTENT.2.NBT.B.5. 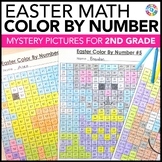 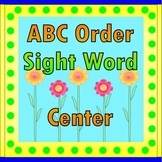 The product includes 40 Bingo Cards 50 Calling Cards 8 Blank Bingo Cards Sheet of 25 Blank Calling Cards All with a fun spring theme.